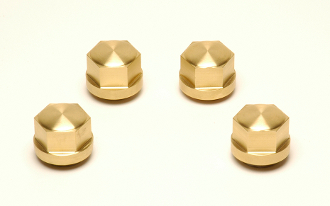 Our Brass Nuts lend a cool retro flair to your Evolution or Twin Cam powered ride. These stylish head bolt covers slip over the existing head bolts and are secured with a setscrew, which can be positioned to the side and accessed between the fins. This item measures approximately 1.0" wide X 1.0" deep X 1.0" high.